Home » Face » Blush » Nobody Loves the Smashbox Masquerade Illusion Baked Fusion Softlights but me! Nobody Loves the Smashbox Masquerade Illusion Baked Fusion Softlights but me! We all have seen the gorgeous Smashbox Masquerade Eyeshadow palette, and the O Glow Noir gloss and maybe even the Intrigue cream blush and lipgloss. But I have noticed a void. No one seems to have any love for the Masquerade Baked Fusion Softlights palette in Illusion. No one but me anyway. Try doing a search online – there aren’t many reviews on this and I wonder why. Admittedly, this palette is a throwback to the ones from Clinique back in… was it 2006 or 2007? You know the “dark ages” 😛 Time moves so fast these days! But you might remember them. I have the ones from Clinique and they were great. But they were limited edition. There were some drugstores ones too (Jane and the like) Anyway, this one’s from Smashbox and its called Illusion, and I like it. 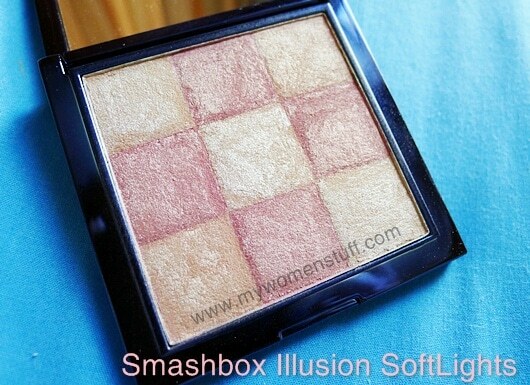 Smashbox has what they call the Baked Fusion Softlights which is like a highlighter and blush in one. If you are pale enough, they act as blush. If not, they act as highlighters. Illusion is a pale peachy gold highlighter that can pass for a peachy gold toned blush if you are fair enough. Although it is shimmery, it is not glittery (there is a difference) so it is wearable and it applies prettily over cream blush, or over any blush to accentuate cheekbones. Just be careful not to overdo it, and you’ll be fine. I like using a fluffy brush so you don’t overdo things. Smashbox Baked Fusion Softlights palette in Illusion retails for RM119 at Smashbox Cosmetics’ counters – Parkson Pavilion Kuala Lumpur & Parkson 1 Utama. It is part of the Smashbox Masquerade Fall 2010 collection and is Limited Edition. PREVIOUS POST: Shopping with Sasa.com : Be Aware! NEXT POST: Does the MoroccanOil Oil Treatment live up to its hype? Wow, this is such a lovely glow! YOu know what? I had a makeover at The Body Shop and they used a similar highlighter and it gave such a gorgeous Glow that i can’t stop staring at my skin when I got home! So i kinda have the idea why you like this! Great day! Thank you Nikki! This is one of the best highlighters I’ve used to date 🙂 no oily look! I think it’s gorgeous- I remember the Clinique ones but I was a poor student at the time and couldn’t afford them. 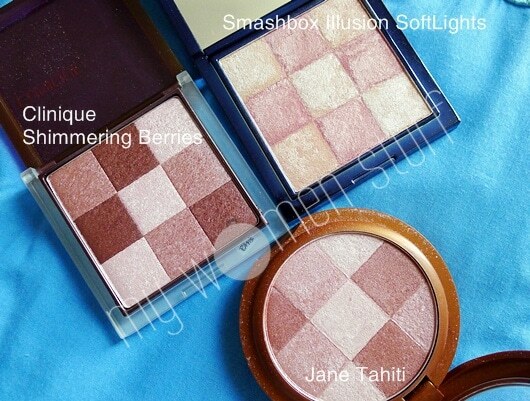 The glow of the Smashbox one is so pretty. Well with price sometimes does come quality especially in something like highlighters which can get crazy glittery if not done right. I’ve always wanted one of these. Think there was a drugstore brand Physician’s Formula that had these highlighters back in the day. The Smashbox one looks so pretty. I’m loving all the new Smashbox stuff that’s been coming out recently. Wow, that is so nice!!! I’ve never been a fan of Smashbox due to bad experiences with their products (superbly cracked lips from the O-Glow and breaking out from the Photo Finish Light Foundation Primer) but their latest collection (especially the eyeshadow palette) does seem worth checking out. But I might pass on this item as I am quite tan and won’t be able to pull of pink highlighted cheeks. I prefer yellow-toned highlighters like my HG Dior Amber Diamond (for day) or NARS Albatross (for night). Love the look of the blush/highlighter on you though. Okay I think I am quite off topic here as I dont own or tried any cosmetic products from Smashbox but I only have their Smashbox Foundation Brush 13 and I super super love it hehe, as much as I love all my Eco Tools Brushes! Thanks for the review, I was wondering about this. It looks so pretty and glowy on you! Looks pretty! I use the Guerlain Meteorites – how does this compare as a highlight? hm… i have thinking about this for a while and never really bothered to look at it. Not sure why. Thank you. Its totally different from Guerlain Meteorites. Think of this as a blush/highlight like a more subtle Bobbi Brown Shimmerbrick. Meteorites are more like finishing powder to me.